Directeur de Collection : Benos Dale J.
Membrane permeability is fundamental to all cell biology and subcellular biology. The cell exists as a closed unit. Import and export depend upon a number of sophisticated mechanisms, such as active transport, endocytosis, exocytosis, and passive diffusion. These systems are critical for the normal housekeeping physiological functions. However, access to the cell is also taken advantage of by toxic microbes (such as cholera or ptomaine) and when designing drugs. Ernest Overton, one of the pioneers in lipid membrane research, put forward the first comprehensive theory of lipid membrane structure. His most quoted paper on the osmotic properties of cells laid the foundation for the modern concepts of membrane function, most notably important in anesthesia. 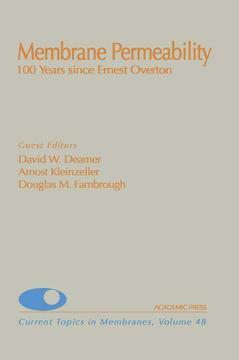 This book is designed to celebrate the centennial anniversary (in the first chapter) of Overton's work. Subsequent chapters present readers with up-to-date concepts of membrane structure and function and the challenge they pose for new explorations. A. Kleinzeller, Overton's Concept of a Cell Membrane. T.J. McIntosh, Structure and the Physical Properties of the Lipid Membrane. A. Pohorille, M.H. New, K. Schweighofer, and M.A. Wilson, Insights from Computer Simulations into the Interactions of Small Molecules with Lipid Bilayers. D.W. Deamer and S. Paula, The Permeability Barriers to Ions and Polar Solutes. A.S. Verkman, Water Permeation Across Membranes. E.K. Hoffmann and J.W. Mills, Membrane Events Involved in Volume Regulation. D.S. Cafiso, The Interaction of Natural and Model Peptides with Membranes. M. Saxton, Lipid-Peptide Diffusion in Membranes. C.M. Armstrong, A Short History of Ion Channels and Signal Propagation. K. Miller, W. Sandberg, and B. Dubois, The Lipid Membrane and Ligand-Gated Ion Channels in General Anesthetic Action. S.M. Robbins and M. Hollenberg, Plasma Membrane-Localized Signal Transduction. R.L. Post, Active Transport and Pumps. Biophysicists, biochemists, pharmacologists, cell biologists, and neuroscientists interested in membrane permeability.